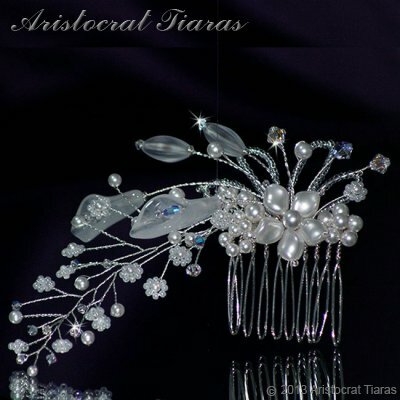 Lady Amelia hair comb from Aristocrat Tiaras features a pearl flower created with Swarovski twist beads and white jade lily beads among pearls, pearl flowers and crystals with flowers created from quality Japanese seed beads trailing down in a floral arrangement. A truly stunning hair comb that will complement any bride's hairstyle on the wedding day. All our bridal tiaras and hair accessories are handmade in Herefordshire UK. Colours and designs may vary slightly from the picture. Ready to ship! This hair accessory could be with you by 1pm Saturday 20th April (tomorrow).